Kate Ormond Schoolfield Tillett‘s obelisk monument in Green Hill towers above the flat grass markers nearby. The draped urn has fallen from the top, but the rest of the white marble has held up reasonably well, considering Kate died over a century ago. 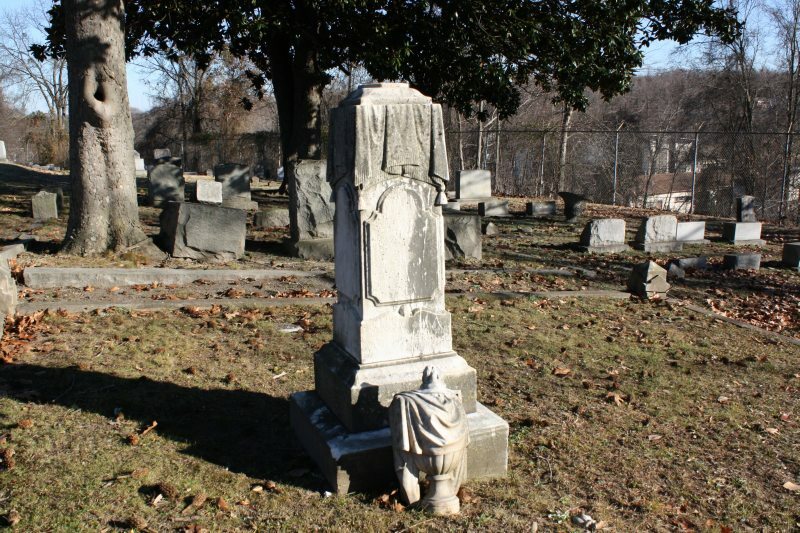 Details, such as the flowers carved above her epitaph and the stone drape design at the very top, are still in good condition. Kate is one of many Schoolfields buried in various plots throughout the grounds of Green Hill. Kate was the daughter of John H. and Susan France Schoolfield, born on August 16, 1866 in Henry County, Virginia. 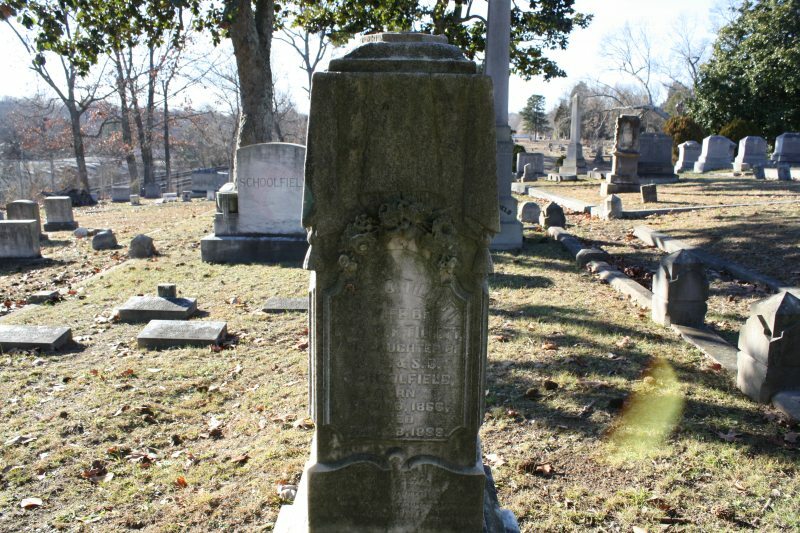 John had already made a name for himself in Horsepasture as a tobacconist and merchant by the time he moved to Danville in the early 1880s. He, two of his brothers, and several other men would soon form Riverside Cotton Mills which later became Dan River, Incorporated. 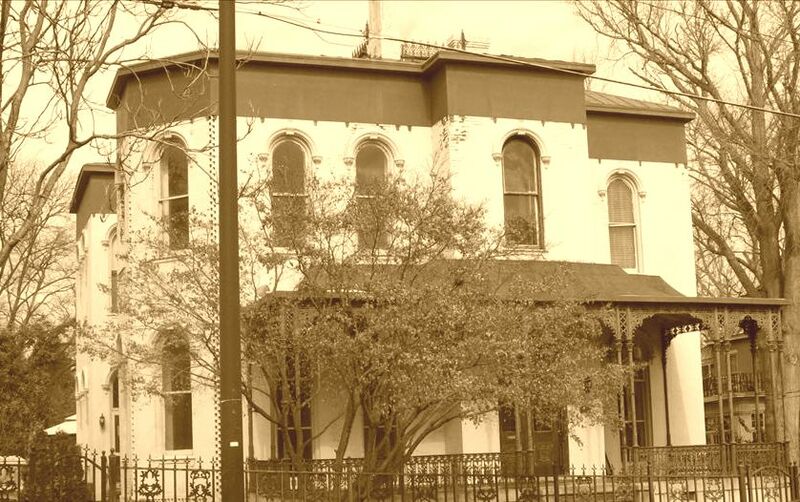 John, his wife, and their children lived at 944 Main Street, a mansion which still stands today. Kate like many of the affluent people of those days probably enjoyed a life full of social events and luxuries not available to the working class or the impoverished people of Danville. But as I’ve said before, death doesn’t care about your socioeconomic status. 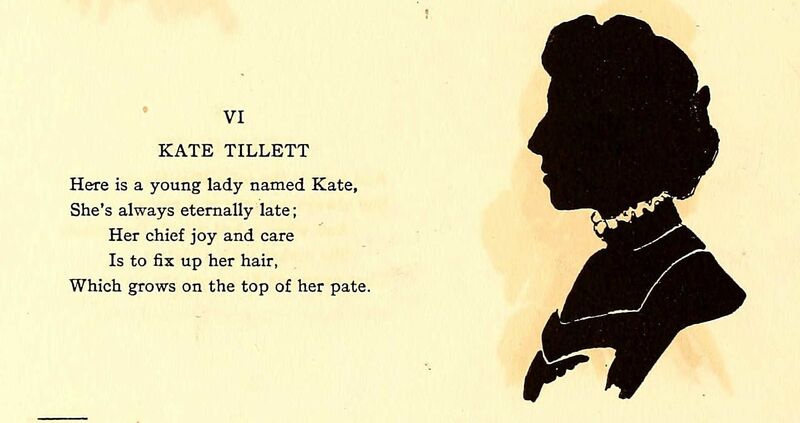 On November 15, 1888 Kate married Rev. 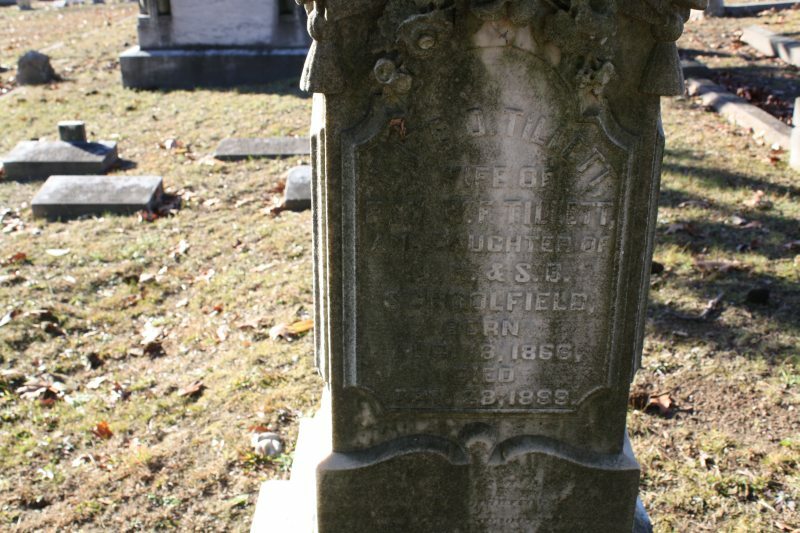 Wilbur Fisk Tillett, a Methodist minister and Dean at Vanderbilt University.4 Their marriage would be short-lived, as Kate died on September 28, 1889 of “puerperal pelvic cellulitis”. On Sept. 4 she had given birth to the couple’s first child in Danville, a daughter also named Kate. (I’m not sure if Wilbur and Kate lived in Danville after the marriage or had just returned to her hometown to give birth.) In the few weeks in between Kate Jr.’s birth and the elder Kate’s death, the mother developed the infection from which she would die. In the 1800s such a diagnosis would have resulted from symptoms such as intermittent fever with chills, severe pelvic pain, a pelvic abscess tumor, rapid but weak pulse, sweating (especially during sleep), and pain in the limbs. Often an “exploring needle” would be used to probe the tumor to detect the presence of pus, then the abscess would be allowed to drain on its own or be drained.5 While there is no information about Kate’s specific treatment, one interesting source on midwifery from 1873 lists the use of leeches applied to the groin, uterus, or perineum as one method to combat the inflammation associated with puerperal pelvic cellulitis.3 Yikes.